As one of the earthiest and most organic building materials in use today, timber is guaranteed to be found in almost every building structure and garden landscape in Australia. Once man discovered how to convert trees into timber and begun using it to construct all sorts of different things, such as decking and framing, timber became an integral part of our homes, commercial buildings, parks and other structures. Throughout all this, an aspect of the timber industry that started to grow was the treatment of timber products. In order for timber to remain sustainable after it had been harvested, it needed to be treated and preserved. 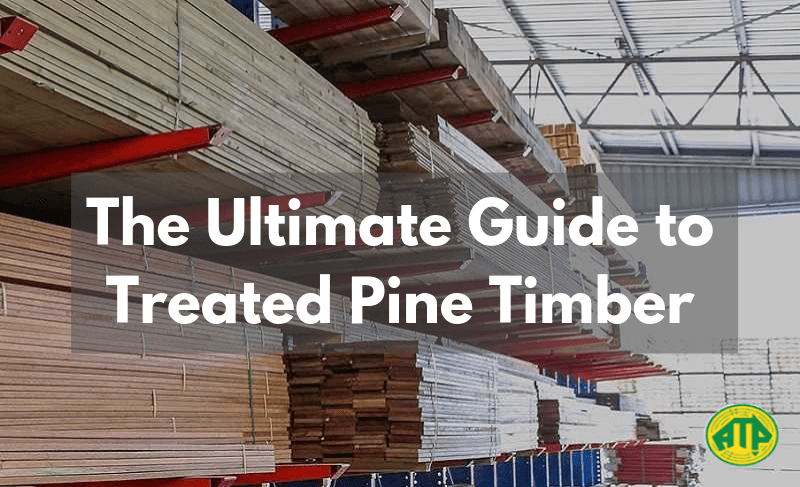 Whether you are someone who knows something about treated pine timber, or conversely are a newbie in terms of your knowledge, you’ve come to the right place. Today, we are here to give you the low-down on treated pine timber and answer all your questions about this magnificent product. More specifically, we want to educate you on the what, why and how regarding its treatment. In essence, treated pine timber is the name given to pine timber that is treated for longevity. Pine is a game-changing timber that has helped the climate of the world’s timber industry. It grows in a vast array of different environments, is easy to raise and plant, and only requires a very short amount of time in order to yield large amounts of usable timber. It is important to note that treated pine is a softwood, meaning it does not have pores. When compared to hardwood species, it also has long fibres. When most people think of hardwoods and softwoods, they immediately imagine hardwoods as much denser than softwoods. While this is somewhat true in most cases, there are times when it is not. As a matter of fact, pine timber can be more dense than many hardwood species. The good news is that pine is actually quite malleable and easy to work with. Pine is approved for use by many environmentalists as it is one of the more sustainable timbers currently available. In Australia, pine is harvested from plantations that are regulated by government organisations whose job it is to ensure that environmental impact is minimised. Using plantations helps because it allows us to reduce our demand on timber from our state forests. Because of the speed pine grows at in plantations, it is one of the most popular, cost-effective and sustainable timbers available. Before final use, pine is usually treated for a number of reasons. Treatment is the process of permeating timber with a chemical solution. Almost all forms of timber benefit from being treated before use. There are a few reasons for this, with the strongest and most commonly known reason being longevity. By treating pine timber, you are making it resistant to forces of nature such as rot and decay—not to mention protecting it against insects that can tear through the wood. This is especially true for timber that is installed in-ground and utilised in landscaping project, though even timber fitted indoors for decking and other applications benefits from being preserved. Once treated, pine timber becomes a much more viable option for building, construction and engineering applications. By applying this kind of lasting treatment to timber, you are unlocking timber’s ability to be used in a whole lot of various applications, some of which we will discuss later in this article. When treating timber, there are different levels to which it can be preserving, depending on the hazards to which it will exposed to, based on its application. To understand this better, the different in-service conditions have been classified with a hazard (H) class. Timber is treated to the relevant H class for its use. The higher levels are protected to a greater degree, and are suitable for use in all the lower level applications also. H1 – Designed to minimise the chances of an attack by insects and termites, H1 treated timber is best used in well-ventilated places where the timber will be kept off the ground and isolated from weather conditions, including rain or any moisture. Its typical uses are framing, flooring, furniture and interior joinery. H2 – Similar to H1, H2 is also designed to minimise the risk of an attack by insects and termites, and can be used in well-ventilated places where the timber will be kept off the ground and isolated from weather conditions, including rain or any moisture. H2 however, is more resilient and doesn’t need to necessarily be kept in a well ventilated area. It does however need to be prevented from wetting. Its typical uses are framing, flooring and any other dry situations. H2F – Also designed to minimise the risk of an attack by insects and termites, H2F must be protected from wetting, and is commonly used for framing (envelope treatment) and used in dry situations south of the Tropic of Capricorn only. H2S – Similar to H2F and previous levels of treatment, H2S protects timber against insects and termites, but it also allows for subject to periodic moderate wetting. You will find H2S commonly used in the treatment of LVL/Plywood (glue-line treatment) used in dry situations south of the Tropic of Capricorn only. H3 – The next level of treatment, H3 is suitable for use in applications where the wood is kept off the ground and exposed to weather conditions and periodic moderate wetting. Most commonly you will find this treatment being used in weatherboard, fascia, pergola posts (above ground), window joinery, framing and decking. H3A – This level of treatment is designed to be applied to products that are predominantly in vertical exposed situations and intended to have a supplementary paint coat system that is maintained regularly. The most common uses for H3A are found in fascia, bargeboards, exterior cladding, window joinery, door joinery and non-laminated verandah posts. H4 – This is the first level of treatment that is suitable for use in applications where the timber is in contact with ground or is continually damp. H4 is designed to minimise the likelihood of attack by insects, including termites, and radical decay where a critically important end use is involved. Typical uses for H4 include fence posts, greenhouses, pergola posts (in-ground) and landscaping timbers. H5 – A stronger level of protection, H5 is suitable for use in applications where the timber will come in contact with the ground or fresh water. Other than protecting against the likelihood of attack by insects, H5 also offers protection against extreme decay. Common applications that call for H5 include retaining walls, oiling, house stumps, building poles and cooling tower fill. H6 – As protection against the highest level of hazard, H6 is appropriate for applications where the timber will be in prolonged contact with sea water. H6 is designed to minimise the likelihood of attack by marine borers and extreme decay. You tend to find H6 used only on boat hulls, marine piles, jetty cross bracing and other similar applications. In Australia, there are two types of preservatives commonly used to treat wood: CCA and ACQ. Created as a fungicide and termiticide, CCA is the most popular timber treatment type used today. Applied to wood using a pressure treatment, CCA is extremely effective, cost efficient, and more widely available than its counterpart—ACQ. When used in outdoor conditions, it has been known to last as long as a few decades. It would seem CCA is the perfect treatment type, except that research over time has uncovered some concerns over the safety of the chemicals used in CCA. In Australia, CCA has been restricted by the APVMA for use in applications where close human contact is a risk. However, CCA is still commonly used in timber sleepers for retaining walls, fence lattices, verandah posts, farm fencing, weatherboards, marine use and building timber. On the other hand, ACQ is a waterborne form of timber treatment, developed to combat the safety concerns inherent in CCA. Similar to CCA in effectiveness, the prime advantage of ACQ is that it contains no arsenic, exponentially reducing its toxicity and risk of causing hazard. ACQ is approved for use in many of the applications CCA is banned in, including garden furniture, picnic tables, exterior seating, children’s play equipment, patio and domestic decking, and handrails. ACQ is a great option for treatment, with the only disadvantage being that it costs more than CCA due to its more limited availability. Where is treated pine timber most commonly used? Treated pine is commonly used in a wide array of applications. Some of these include timber sleepers, decking, frames, stairs, greenhouses, landscaping projects and patio furniture. If you need excellent timber that will go the extra mile for you, treated pine is the way to go. As you can see, with the correct treatment, it can mostly withstand the conditions of whatever environment it’s placed in. Not only does it offer longevity, but it also provides economy, versatility and good looks. Want to learn more about treated pine timber? Call 03 9305 2000 today. What are you planning on using treated pine for? Will you opt for CCA or ACQ? Let us know by leaving a comment below. « Which Timber is Best for Decking?